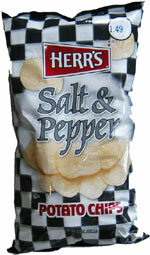 Taste test: Lots of pepper are on the outside of the chip, there's a slight greasy taste to them (a bit greasier than the Utz salt & pepper), but otherwise very tasty. The pepper gives you a bite as an after-taste, quite enjoyable. Smell test: Strong peppery smell.